If you live in the Conejo Valley or a nearby community, please attend a meeting to be held by the Conejo Recreation and Park District (CRPD) and press for a pump track and bike park to be included in the plans for the Lang Ranch Community Park. On Wednesday, February 8th, CRPD will have a meeting to get public input into recreational activities they would like to see included in the Lang Ranch Community Park and other parks in Zone 2, roughly north of Hillcrest Drive and east of the 23 Freeway. Two weeks ago we learned that CRPD has scrapped their plans for baseball fields and tennis courts on the 124-acre property bordered by Westlake Blvd, Erbes Rd and Aveninda de Los Arboles. An ancient landslide at the site makes it unfeasible to economically grade the land to safely accomodate playing fields. Instead, CRPD is exploring less intensive uses that won’t require extensive grading. 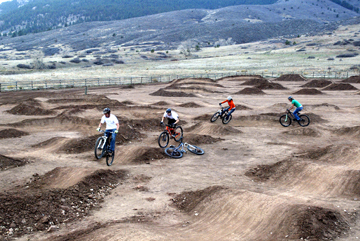 This is our chance to lobby for a bike park and pump track in a semi-urban area. Our kids and the young-at-heart could use to improve their balance, coordination, upper body strength, and generally have fun! In this age of video games, “sweet/salty snacks” and increasing obesity among our youth, everyone should appreciate a healthful, outdoor activity to engage them. 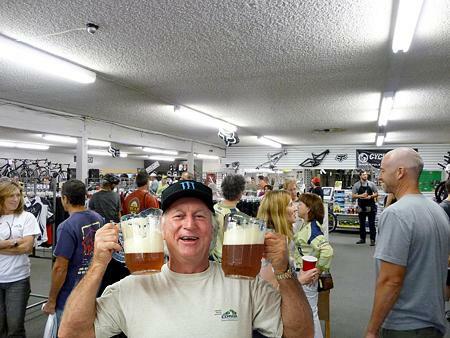 Newbury Park Bike Shop Hosts CORBA Fundraiser 2/24/2012. As we reported last year, a new General Plan is being developed by California State Parks for Topanga State Park. The plan will guide the park’s future, ensuring that management practices are in line with the mission and objectives of the Park. The general plan does not govern trail use designations, and instead defers to the Santa Monica Mountains Trails Master Plan, which is still in development. 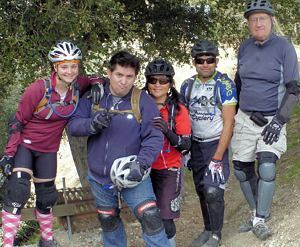 On January 14, 2012, volunteer crews once again tackled the Gabrielino Trail between Switzers and Redbox. CORBA combined forces with the Mount Wilson Bicycling Association, our neighboring IMBA chapter. We continued on our work from our last trailwork event in December, working on approximately 2 additional miles of trail. The crews cleared and rock-armored several drainages, cut back brush, repaired damaged trail tread, and cleared rock and other debris from the trail. 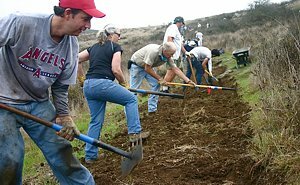 California State Parks has asked CORBA and other organizations to recruit volunteers to help with this work. The event on Feb. 25th will be the first, and we need a large turn-out to help clear the brush that has built up over the past several years. Further events to clear brush further up Guadalasca are planned for March 17th and April 14th. Please complete our on-line registration form in advance to qualify for prizes and so we'll know how many tools to bring. Saturday March 24, 2012: COSCA Spring Trailwork Day. Fri-Sun April 27-29: State Trails Days in Point Mugu State Park. Next CORBA Kids Club ride will be Saturday February 4th at Malibu Creek State Park. See our Rides Calendar for details. 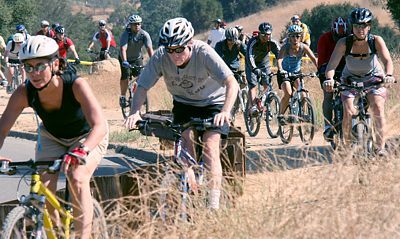 CORBA, Newbury Park Bike Shop and the North Ranch Mountain Bikers will host and lead two rides on Sunday, February 26th. Both rides leave from Newbury Park Bike Shop at 8:00 am. Directions: The rides start at Newbury Park Bike Shop, 1560 Newbury Rd # 6, Newbury Park, CA 91320. Exit the 101 Freeway at Ventu Park Rd in Newbury Park, turning south. Take the first right onto Newbury Road, following it around 0.3 miles. Turn left into the strip mall; the bike shop is behind In ‘n Out Burgers.